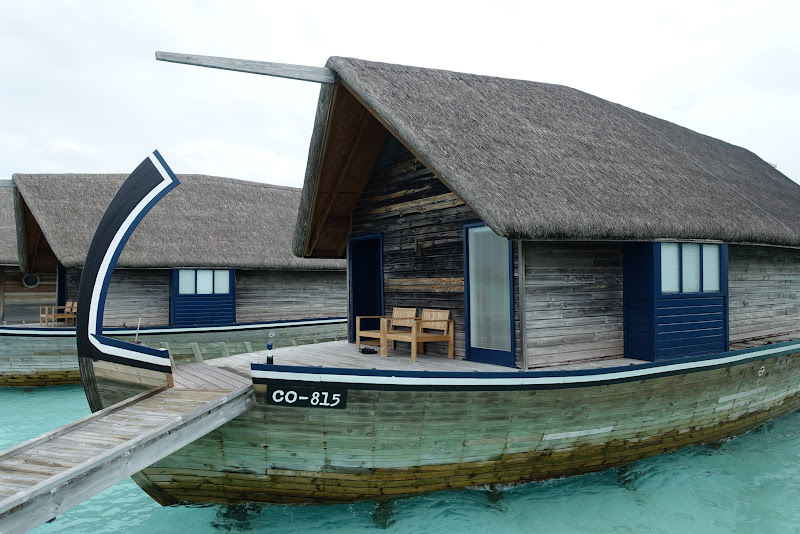 For the last leg of our honeymoon, we booked 4 nights at Cocoa Island by COMO in the Maldives. May through October is actually the low season in the Maldives, so we were able to book our stay with the following promotion: Pay for 3 nights, and get the 4th free, plus $150 USD resort credit for each of the three paid days (can be used on food, drink, and spa -- not that we ever use the spa facilities when we vacation). Even with this promotion, it was still a very expensive stay; I don't know when we'll be able to justify another trip back! 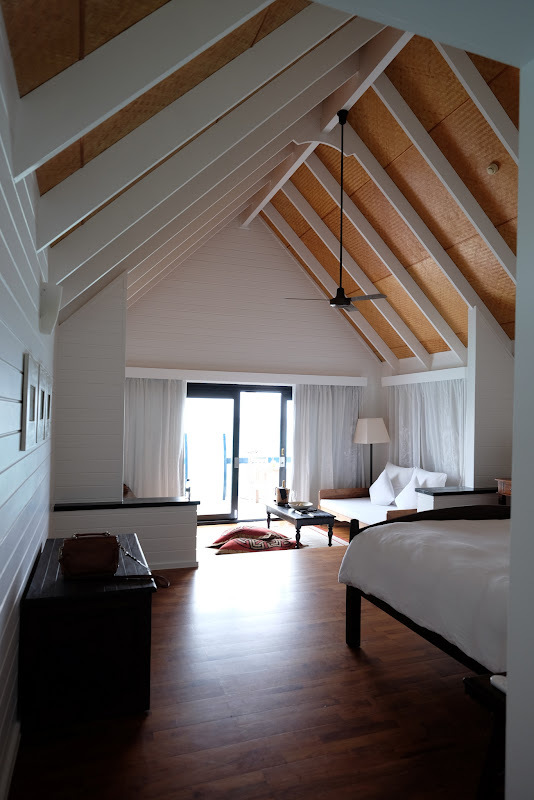 There are a lot of gorgeous looking accommodations in the Maldives. 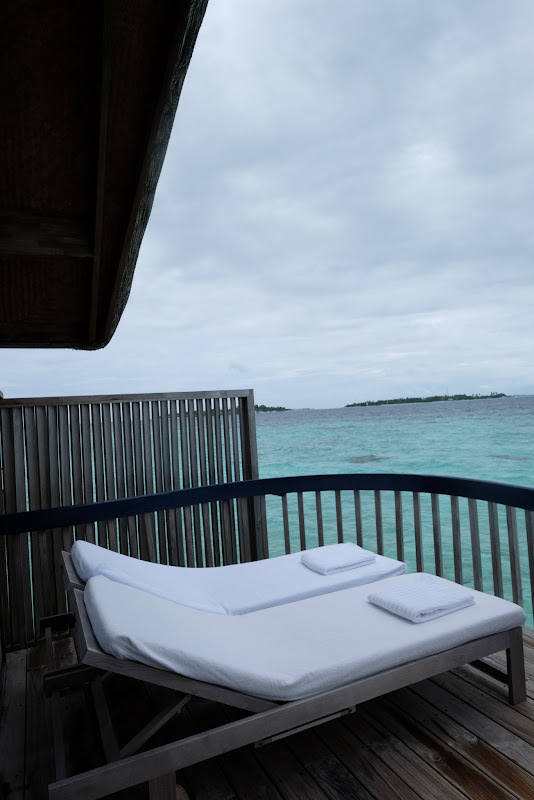 We chose Cocoa Island because of how small it is (only 33 suites), how luxurious the rooms looked, and the wonderful TripAdvisor reviews. 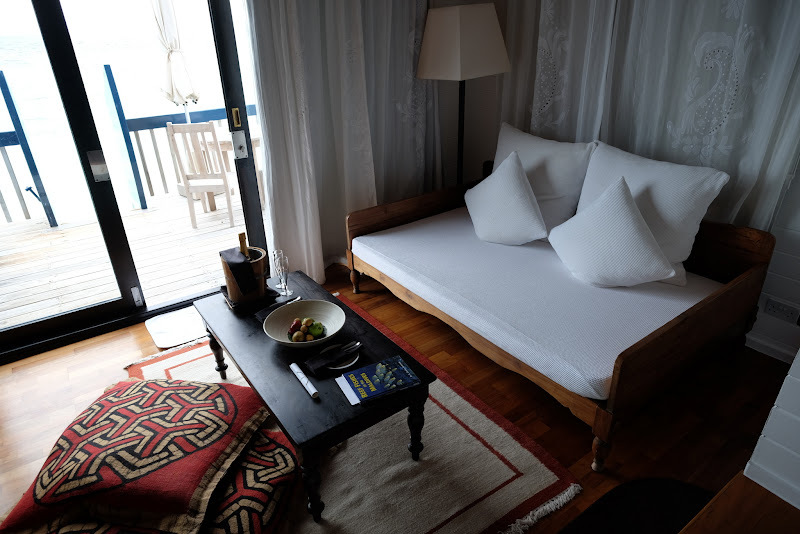 The 4-for-3 nights promotion sealed the deal! 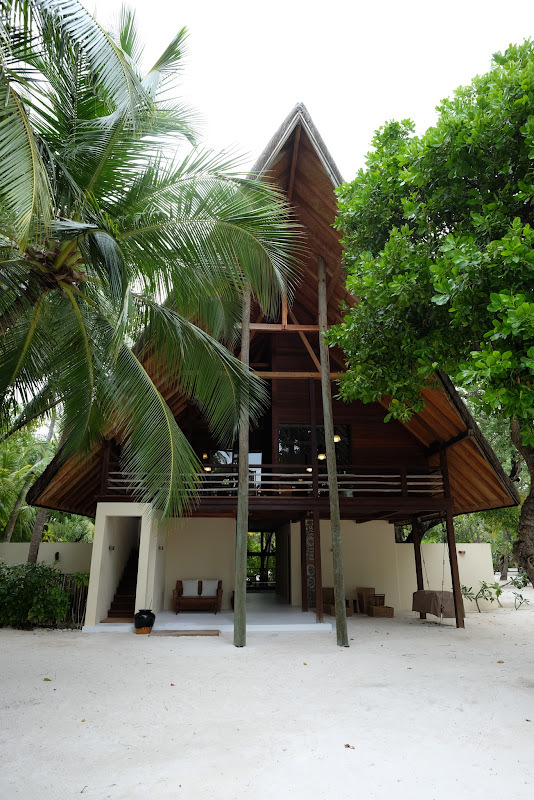 At the time of our booking, we also saw that their sister property, Maalifushi by COMO, had just had their soft opening. With a similar promotion, we almost decided to book it instead of Cocoa Island. However, we decided against it because it seemed like a larger resort that was more geared towards families with children. 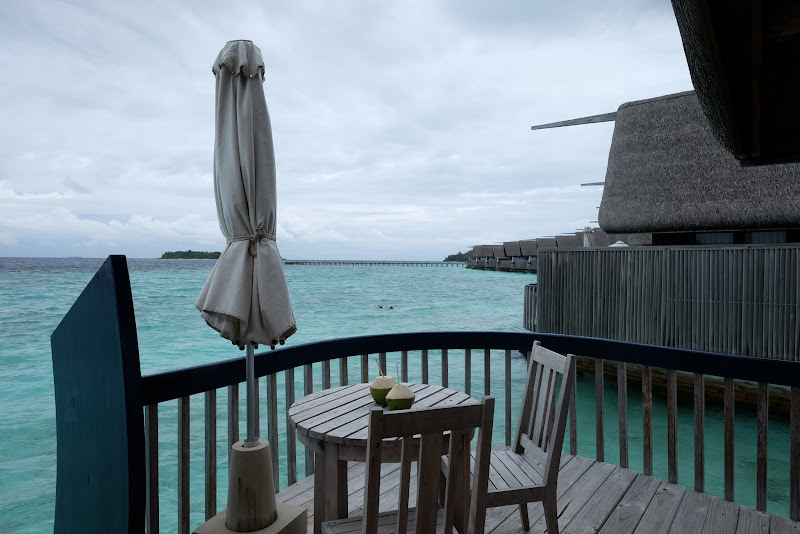 in addition to this, it would have cost more than Cocoa Island, because the seaplane transfer from Male international airport is much more expensive. 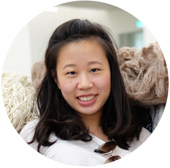 We landed around noon (local time) from Singapore after an easy 4 hour flight. After exiting customs, we were greeted by a representative holding a Cocoa Island sign, and he whisked us to our speedboat. Aside from about 4 employees and the driver, we had the boat to ourselves (I'm guessing not many people staying at Cocoa Island fly in via the super cheap Tiger Air! ), and after a short, but inaudible safety demonstration, we were off! 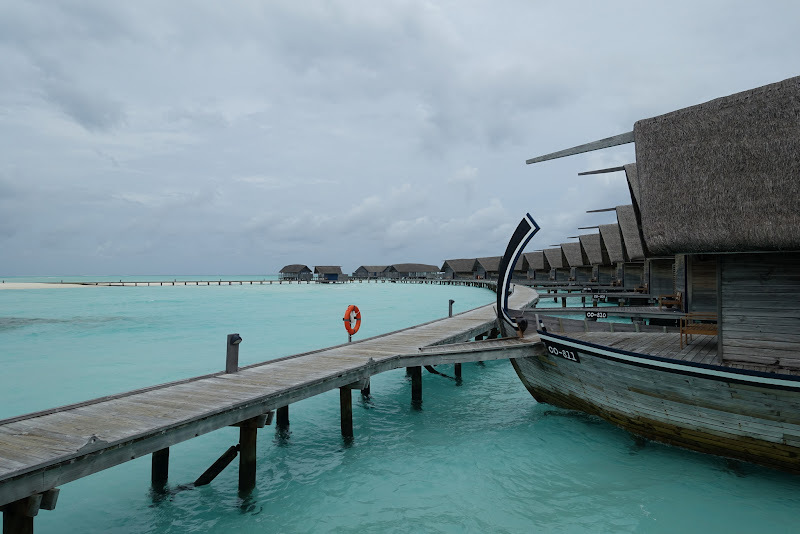 It was a bit cloudy that day, but it still felt totally surreal to be in the Maldives. 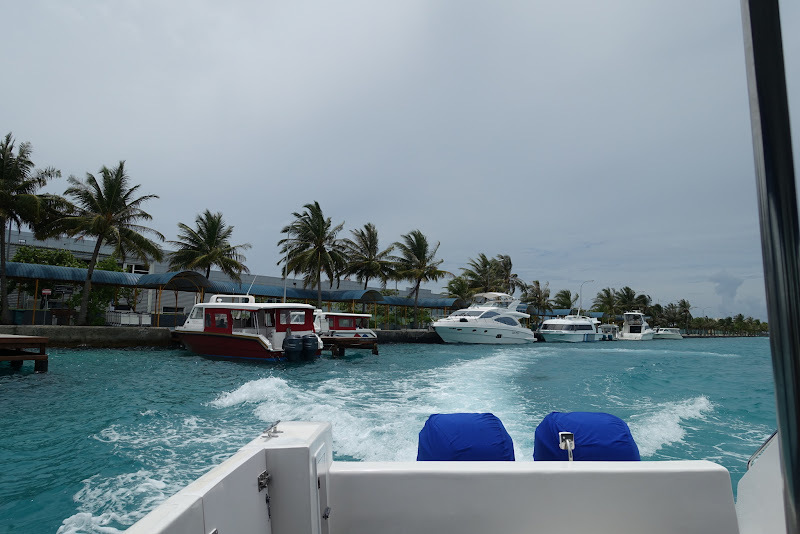 The speedboat ride took about 40 minutes, and we passed by many beautiful looking island resorts. HELLO MALDIVES! Leaving the airport! A bit cloudy upon arrival. 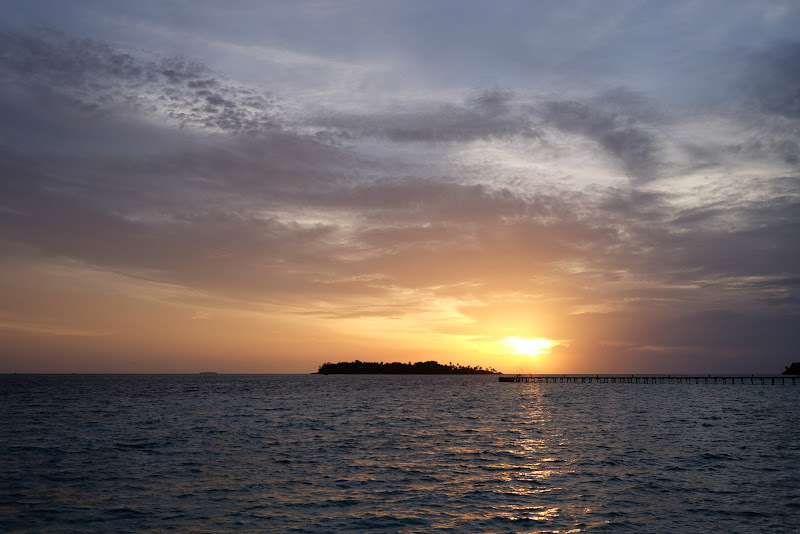 We arrived at Cocoa Island, were helped onto the dock, and led to the reception area while our bags were taken care of. We were presented with two refreshing coconuts to sip on. Check-in was extremely smooth. They asked for our marriage license, though, which struck me as odd. They do have a promotion for honeymoon couples (a free bottle of champagne upon arrival), but only if you were married within 3 months (and they ask you to bring your marriage license). I didn't select this promotion, though, because we got married in May (and our trip was in September, so we were past the 3 months date). However, they already set up the champagne in our room, and told us not to worry about it when I explained we were married in May! I don't drink, so Cory got to enjoy the entire bottle himself (over the course of two days, though!) I thought this was very generous of them, and they handled the situation perfectly. 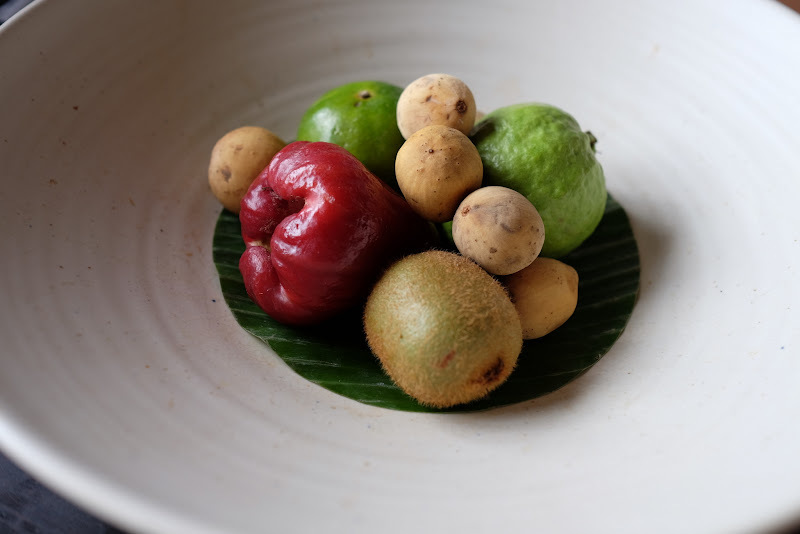 A bowl of local island fruit in the reception area. 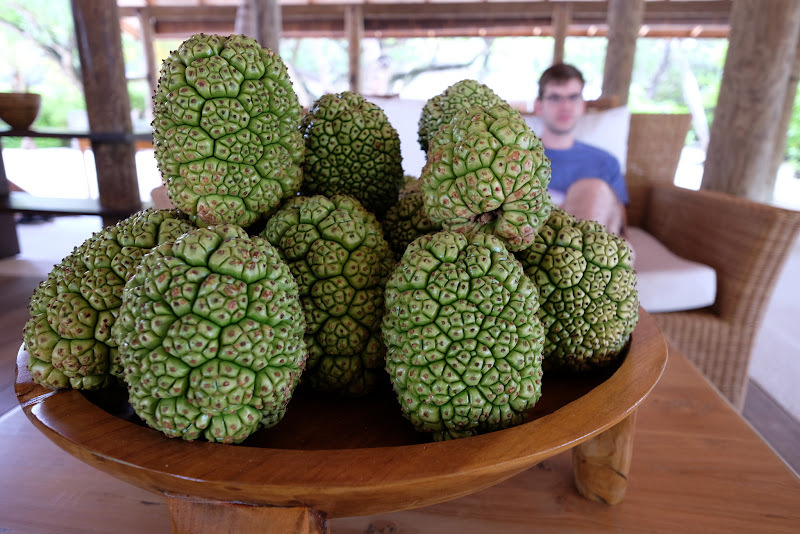 I was told it's not particularly edible, but makes for great decor because they last for weeks! They offered to give us a tour of the island, or, if we wanted to, we could go straight to our room and come by later in the afternoon to take the tour. We were prety hungry by now, and decided to go to our room to shower and have lunch, then have the tour. 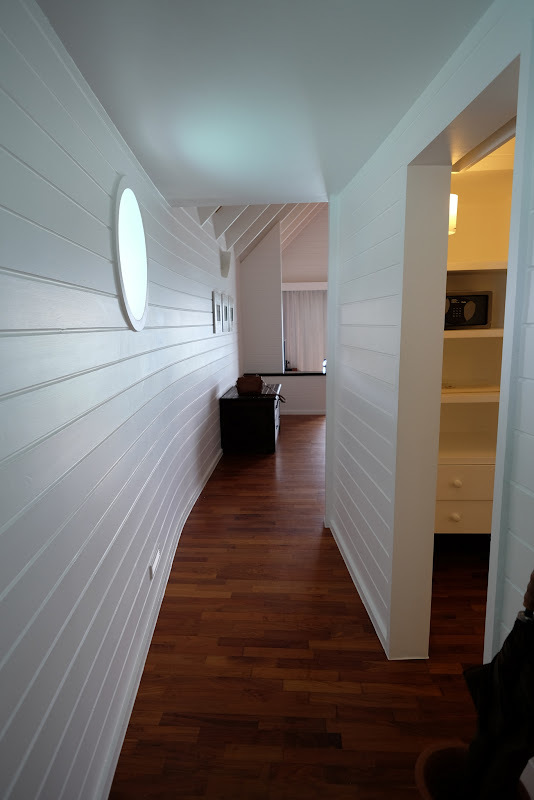 We were shown to our room and given a tour of the amenities. 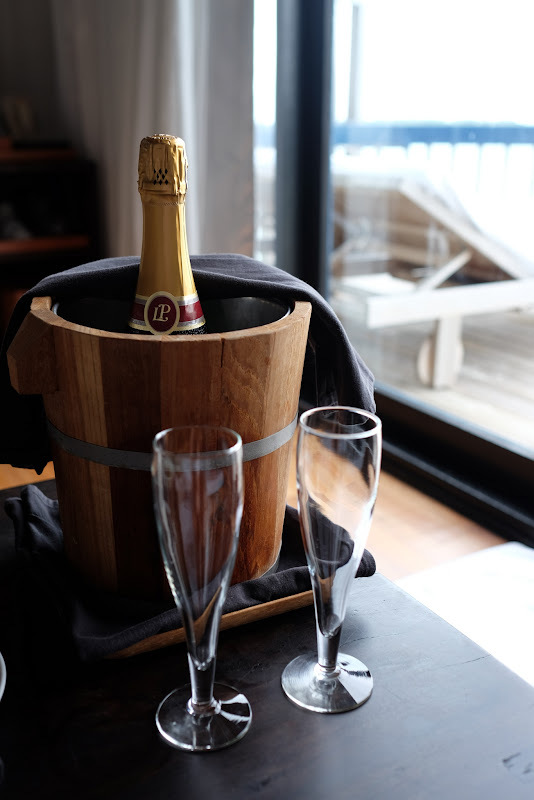 A bottle of chilled champagne was awaiting us, along with a bowl of fresh fruit. 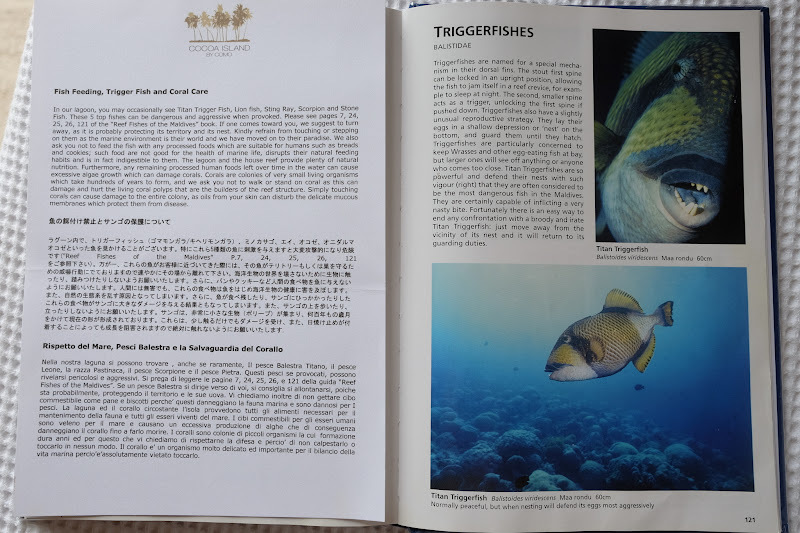 We were also shown a book on local reef fish and, in particular, warned about a certain triggerfish that can be aggressive (Cory would then later claim every fifth fish we saw snorkeling was a triggerfish). Every triggerfish is a fish. Not every fish is a triggerfish. 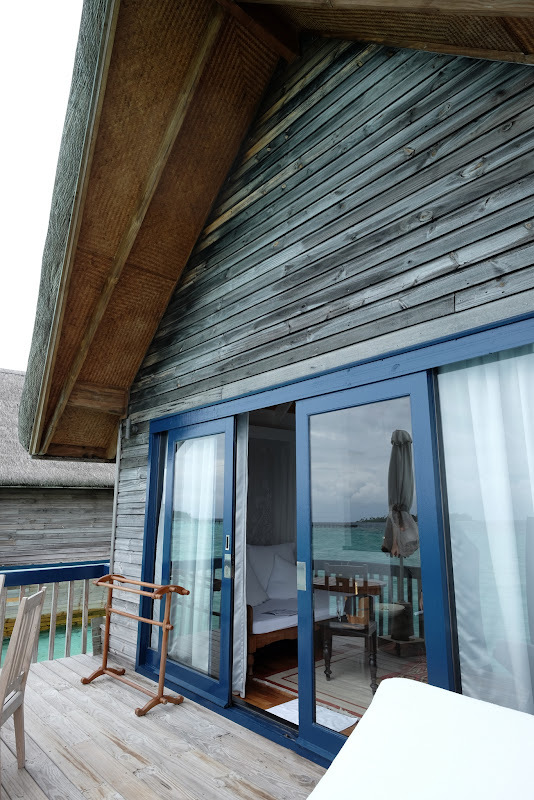 We booked the Dhoni Suite, their smallest suite, which is more than enough space for 2. 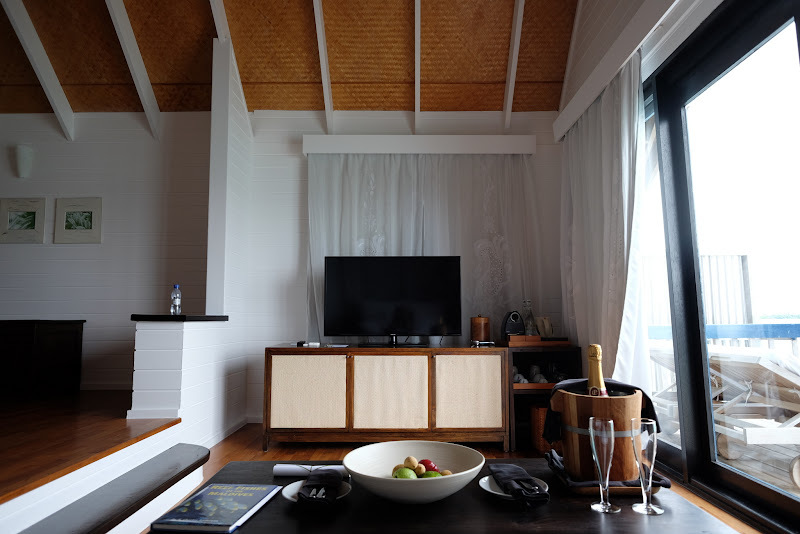 In our experience, it is very rare for a hotel to live up to its promotional photos online, but our room (and Cocoa Island in general) exceeded our expectations! 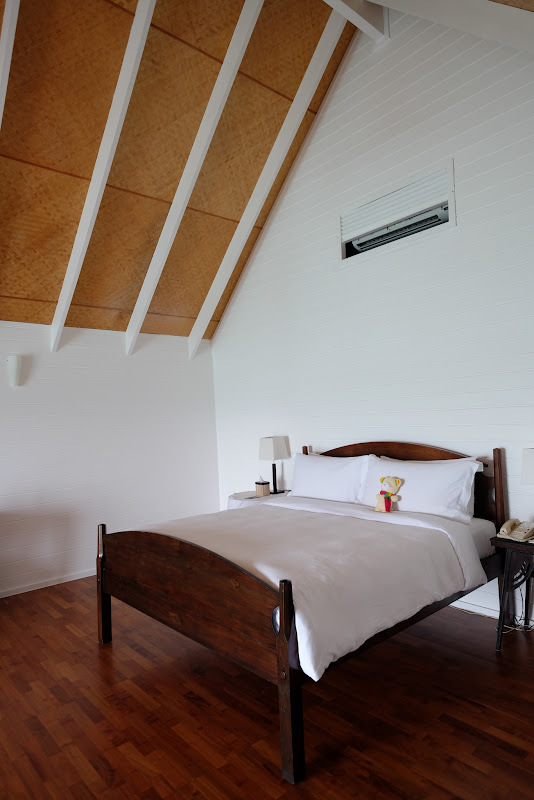 Our suite was bathed in light, open and airy, ultra luxe and modern, and air-conditioned to perfection. Our private deck had terrycloth covered loungechairs and a table with an umbrella and two chairs. 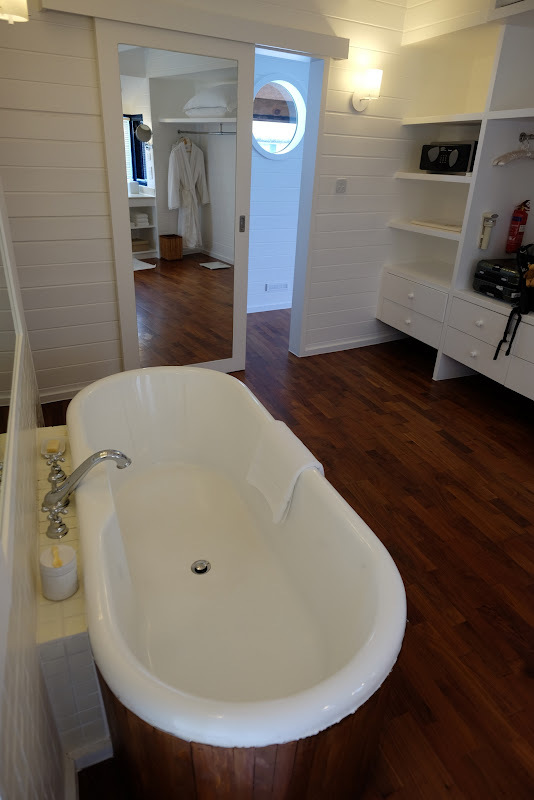 There was also a rack for drying towels and swimsuits, and a freshwater hose to rinse off your feet and snorkeling gear. 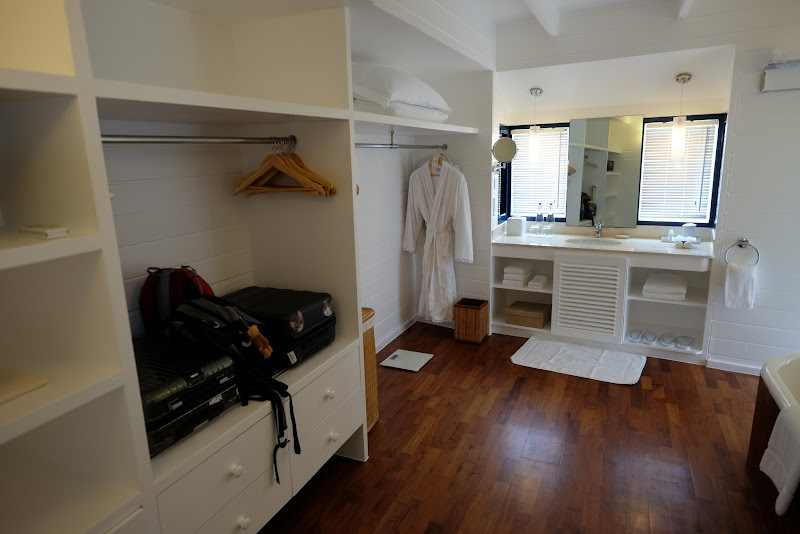 The bathroom was beautifully designed, and I felt like I was staying at a luxurious vacation home, rather than a hotel. The bathroom amenities were nice, and I made good use of the bath salts! 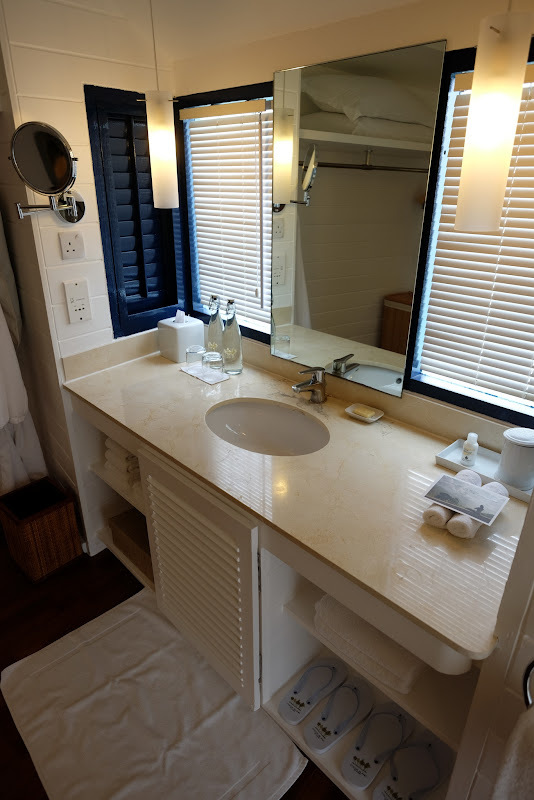 My only criticism of our suite was that the grout in the shower was slightly orange, and needed a good scrub (or spritz with bleach-based cleaner)! Champagne for our honeymoon gift! Never turned on the TV. Coffee and water to the right. After a quick shower (oops, forgot to take a picture of the shower stall), we went to the only restaurant, Ufaa, for lunch (separate post coming!). I was prepared to have mediocre hotel restaurant food for the next four days, so I was pleasantly surprised to find that the dishes were both interesting in concept and extremely well-executed. I will post a separate review on the restaurant, but suffice to say, if it were a restaurant in NYC, I would rate it 5* on Yelp and be a return customer! We swung by reception for our tour of the island, which took about 10 minutes. The island is extremely small, but does not feel crowded at all. There is an infinity pool by the restaurant and bar, and full spa facilities. They have daily yoga sessions in the morning (we're not yoga people either!) here as well. There's a sandbar that you can walk along during low tide (we did this on our last day). They also have a fully equipped dive center, with free snorkel gear rental, and scuba diving equipment and instructors. At the dive shop, you can sign out a mask, snorkel, fins, and a life vest for the duration of your stay (you keep it the entire time, so you don't have to fuss with checking out equipment every day). They have prescription masks, which is AMAZING. Way better than wearing contacts and a regular mask! However, the snorkels are not dry snorkels, which is surprising at such an expensive resort. Dry snorkels are not that much more expensive, so I would consider bringing your own if you plan to snorkel! Or hopefully, Cocoa Island upgrades their snorkels. More on this in a later post! Manta ray spotted near the dhonis! The pros/cons list and bottom line will be on the last post (I'll try to remember to come back and link all the posts together).